Get an exclusive Overdrive car plate keychain with every 2 Overdrive tickets purchased at selected GSC locations! 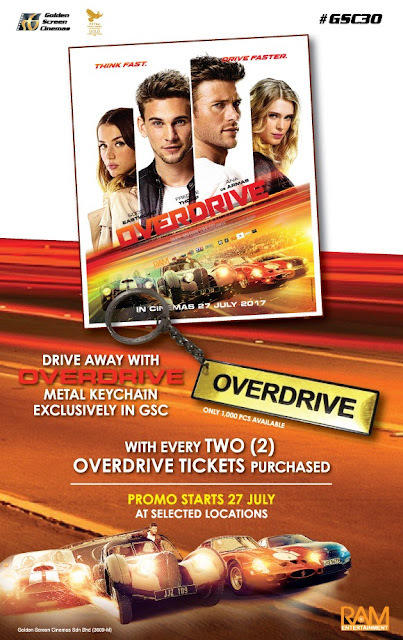 What's in the Offer: 1 (ONE) GSC exclusive Overdrive metal keychain with every 2 (TWO) Overdrive tickets purchased in a single transaction. First come first serve, while stocks last. Only at selected GSC outlets. Buy 2 (TWO) Normal Adult Overdrive tickets in a single transaction. ✓ Get 1 (ONE) GSC exclusive Overdrive metal keychain. Buy 3 (THREE) Normal Adult Overdrive tickets in a single transaction. Buy 4 (FOUR) Normal Adult Overdrive tickets in a single transaction. ✓ Get 2 (TWO) GSC exclusive Overdrive metal keychain. For customers who purchased tickets in advance, please return to the same GSC outlet to redeem your metal keychain if eligible.